The Manage Tool Presets dialog box lets you import, export, delete, and update existing tool presets. Any changes you make to the tool presets are reflected in the Tool Presets toolbar. Name of the currently selected tool preset. Lets you import tool presets that other Storyboard Pro artists created—see Importing and Exporting Tool Presets. Lets you export tool presets to share with other Storyboard Pro artists—see Importing and Exporting Tool Presets. Deletes the selected tool presets. Lets you select an icon to associate with the selected tool preset or upload your own. Lets you set a keyboard shortcut to quickly access your preset. By default, the shortcuts are unassigned. To assign a keyboard shortcut, select Edit > Preferences > Shortcuts > Tool Presets (Windows) or Storyboard Pro > Preferences > Shortcuts > Tool Presets (Mac OS X). Includes the current colour in the new tool preset. Lets you select a drawing layer to be used on the current panel when the tool preset is clicked. When selecting the preset, if the assigned layer exists, it will be selected, if not, it will be created. When changing panels, depending on your global navigation setting, it will look for the layer. If it does not exist, the first layer will be selected. 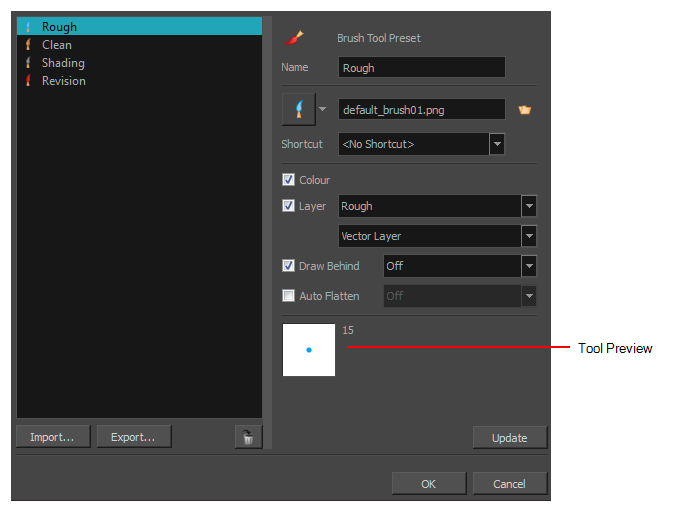 Select the Layer option, assign a layer to the tool preset, and decide whether the layer is vector or bitmap. Displays the size and colour of the tool preset.